Hello everyone, Jane here again on a snowy Tuesday! Do you take part in One Little Word? Last year, and again this year, my word is FOCUS. so this month’s brand new, beautiful FOCUS collection that Nicole has just released for March is absolutely perfect! I created an Art Journal page with it which shares the reason I picked "focus" as my word. I’m sure it is probably an issue we all struggle with these days, there are so many claims on our attention and I don’t even have little ones around anymore who used to add so many interesting and fun distractions every day. 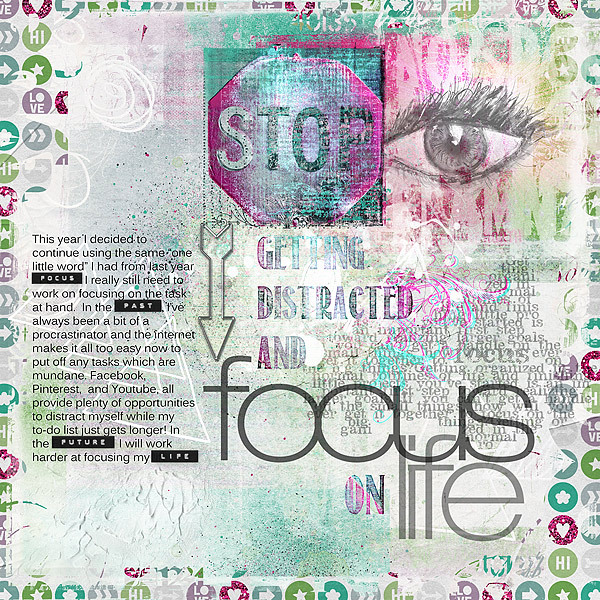 You can find the enormous and fabulous Focus collection at OScraps Credits: http://www.oscraps.com/shop/FOCUS-MegaBundle-WeeklyTemplatesMarch.html I used the Mixed Media papers, Patterned Paper, Artsy Bits, Word Art, Overlay Edges and Artsy Doodles from the collection.